In lesson 4 of the CSS Basic Tutorials we looked at some basic tag selectors (universal, tag, class and id). In lessons 3 and 4 of the CSS Intermediate Tutorials we looked at advanced tag selectors and pseudo selectors, respectively. In this lesson we take a final look at selectors by looking at attribute selectors and how we can use them to select and style our HTML. So What Are Attribute Selectors? Attribute Match - This is where we match by an attribute of the HTML tag regardless of content value. Exact Value Match - The value contained within the attribute exactly matches the value entered. Contains Value Match - The value of the attribute contains the value entered. Subcode Match - Allows subcode matching that will match the value entered or that value with a hyphen and a subcode. For example en, EN-GB or en-us. Lets see some examples of attribute selectors and the impact on tags we are overriding, so we can get a feel for what they do. Open up the file with Notepad we created and tested in Lesson 1: Generated Content. Save the file in the C:\_CSSAdvanced folder as lesson_2_csspage.html and close the Notepad. In the first set of images shown in the screenshot above the first and third images both have a title attribute and so the style is applied to them. In the second set of images shown in the screenshot above, the first image has an attribute with a matching value alt="Chicken Dish" and so the style is applied to it. Look at the second image in the first row of images and the second and third images in the second row of images. As you can see these 3 images all have a blue border on an orange background. 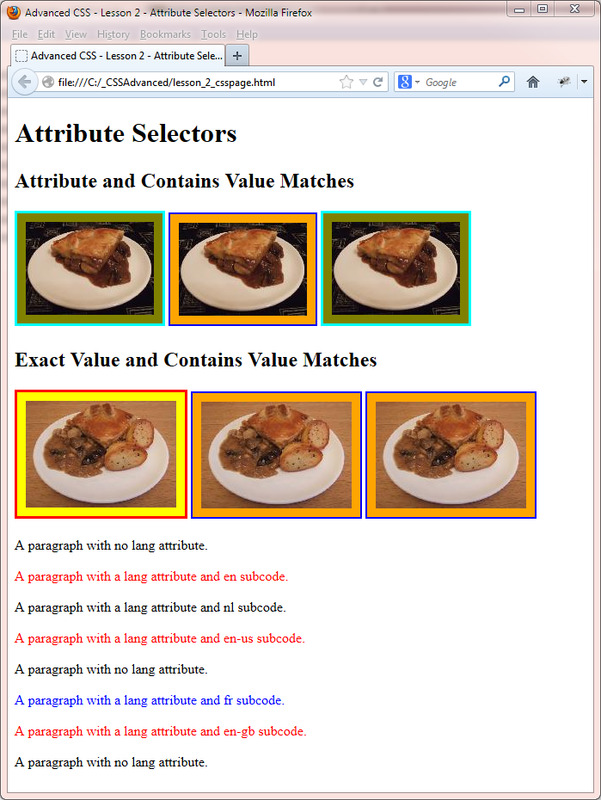 All three of these images have an alt attribute that contains the value "Piee" and so are styled as specified for the contains value match. As you can see from the screenshot any paragraph with the lang attribute and any derivative of the "en" subcode is coloured red. Viewing the screenshot you can see any paragraph with the lang attribute and any derivative of the "fr" subcode is coloured blue. Attribute selectors are extremely powerful and with correct use you can transform attributes thoughout your site with little CSS. Experiment with the styles above and see what results you get. Change some values and attributes and check the results. Getting to grips with selectors is key to really understanding how and why things happen when you utilize CSS. We look at jazzing up our lists with some nifty CSS properties.